Two-time Tony Award winner Nathan Lane starred alongside Laurie Metcalf (who received a 2008 Tony nomination for Best Featured Actress in a Play for her performance) and Dylan Baker (Spiderman 2 & 3) in the world premiere of David Mamet’s play, November, which opened at the Barrymore Theatre on Broadway on January 17, 2008. 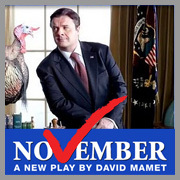 The comedy is set a few days before an election in which President Charles Smith, played by Lane, is running as an incumbent. The action unfolds over one day and involves civil marriage, gambling casinos, lesbians, American Indians, presidential libraries, questionable pardons and campaign contributions. Directed by two-time Tony winner Joe Mantello (The Odd Couple, Wicked), November featured sets by Tony-winner Scott Pask, costumes by Laura Bauer and lighting by Tony-winner Paul Gallo.